Audiolab M-DAC Mini review | What Hi-Fi? 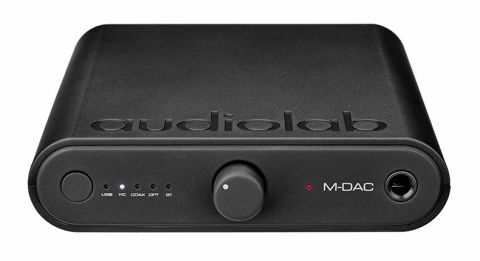 Last year, Audiolab added to the top end of its M-DAC range, so the next logical step was to underscore its Award-winning series of digital-to-analogue converters with a smaller, more affordable entry-level model. So now, joining what is a burgeoning market of desktop-friendly DACs, we welcome the M-DAC Mini into our listening room. It's genuinely portable, smaller than its siblings yet sharing much of same technological DNA – most significantly the ES9018 Sabre32 reference DAC at its core. It’s intended to be easy to function between office, listening room and maybe out-and-about - Audiolab has you covered if you want a bigger, more capable (and more expensive) static DAC/headphone amp. As you’d expect, there are few devices to which the M-DAC Mini cannot be connected. At its rear are digital inputs for phones or laptops – via USB – and coaxial and optical sockets; output is via stereo RCA, coaxial or optical, or (at the front of the unit), 6.3mm headphone socket. As with the M-DAC Plus, which tops the range, the M-DAC Mini also benefits from wireless connectivity via Bluetooth. Those for whom hi-res capability is paramount will be pleased to discover its ability to process PCM files up to 32-bit/384kHz or DSD256 via USB. Another alluring addition to the M-DAC Mini is Audiolab’s decision to make this the first M-DAC with built-in battery. In offering up to seven hours mains-free use, it joins favourites such as the Oppo HA-2 SE and Chord Mojo in helping release high fidelity audio from its previous household confinement. We do have a gripe though. Taking the M-DAC Mini from its box, it just doesn’t feel like £300-worth of kit. Of course, it doesn’t necessarily tell us anything about its sonic performance – using plastic has its benefits beyond the featherlight weight – but the way the chassis gives under the slightest squeeze doesn’t make an entirely positive first impression. Given the comparative sturdiness of many of the M-DAC Mini’s rivals, you’d be forgiven for being disappointed by how it feels for the money. What is pleasing, though, is the tactile volume control on its fascia – flanked by the headphone socket and input control , it gives the whole thing a rather alluring hip-flask aesthetic. But there’s more to it than that. As it's an analogue control incorporating “a high-quality Alps potentiometer of the kind more commonly found in full-size hi-fi components", Audiolab suggests it avoids the issue of lost ‘bits’ common in its digital equivalents that can reduce signal quality. Whatever our reservations about the unit’s casework, we can have no argument with Audiolab’s insistence in making their entry-level DAC measure up on a technical level to its more high-end offerings. We begin by playing The Tallest Man On Earth’s The Wild Hunt, a beautiful but decidedly lo-fi recording that can show up any treble coarseness or lack of support from the bottom end. But the M-DAC Mini is delightfully balanced, with plenty of detail exposing the texture of Kristian Matsson’s vocal just as it does the tonal differences in close- and room mics. There’s momentum, too, in strummed and picked guitar lines alike, allowing them their lilting airiness without forgoing any drive. There’s no sense of the Audiolab hiding behind The Wild Hunt’s sparse instrumentation, either - testing its resolve with Havergal Brian’s Symphony No1 in D Minor only highlights its ability to organise a full orchestra with apparent ease. It’s a superbly spacious, yet cohesive, performance, one where luscious solo lines are allowed to breathe while remaining tethered to the rest of their family. And there’s no danger of such talents coming unstuck even with a lowly Spotify stream sent to the M-DAC Mini via Bluetooth. Audiolab has an aptitude for uniformity even when a file is compressed as much as this, somehow doing its best to dig out as much information as possible without spotlighting the inherent deficiencies of the medium too much. We’d like it to be more expressive, though. We get a sense of the M-DAC Mini being a little too reserved. While it’s far from ignorant of the dynamic subtleties of the music, and despite there being benefits in other aspects of its performance and compatibility, it doesn’t quite express itself the way the Oppo HA-2 SE or Chord’s (admittedly pricier) Mojo do when handling even low-level dynamics. The latter makes a greater deal of the way in which notes are being played, their differing intensity, which makes listening through it less analytical and, ultimately, more entertaining. It isn’t a case of the M-DAC Mini sounding downright dull, but it lacks the overall musicality that would leave us clamouring to add one to our system over its Oppo rival. Yet its talents are abundant, as is are its options of input. For those seeking a finely balanced, spacious performance with plenty of detail, the M-DAC Mini is diminutive only in size.